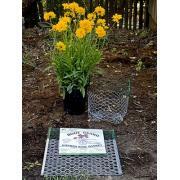 Digger's Root Guard Gopher Baskets 15 Gallon - 17" Diameter | Wyatt Irrigation Supply, Inc. 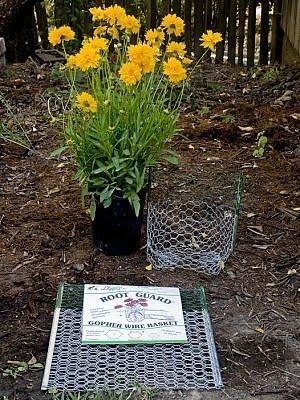 Protect your plants and garden from gophers, install Digger’s Root Guard Gopher Wire Baskets specially designed to provide a durable barrier protecting the plant’s crown allowing your plants to survive even the worst gopher infestation. When choosing the size of Gopher Basket for your plant, we recommend putting your plant in the next size up. For instance, a four inch plant would go in a 1 gallon basket, and a plant in a 1 gallon container would be planted in a 5 gallon basket. By the time the roots are reaching the perimeter of their basket, the plant is well established and the root ball is protected. 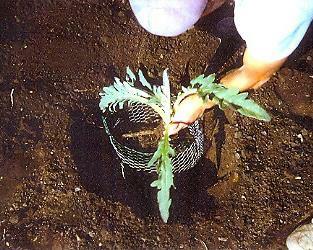 The little roots that would grow through the openings could be nibbled on without harm to the plant's growth. These specifications were chosen to resist gophers from passing or chewing through it. The steel wire strand is 20 gauge and galvanized after weaving for ideal strength and corrosion resistance. Gopher wire is a hexagonal wire mesh that measures 3/4" across the flats of the hexagon. 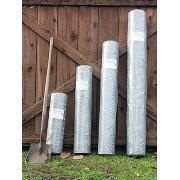 Gopher wire is hot-dipped galvanized after it is woven, it will easily last 6-10 years. 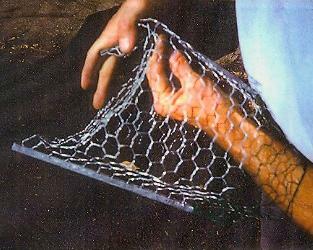 How is gopher wire different than other wire mesh such as chicken wire or aviary wire? Chicken wire has 1" openings which are too big and can let gophers through. Also, the chicken wire is not hot-dipped galvanized and can rust out in a matter of a year or two. Aviary wire has 1/2" openings but uses very thin wire strands that gophers can chew through.